What a great vegetable dish. This could be served as a side dish or a main course. I found this recipe at Jen's beautiful blog and knew I was going to like it. Roasted garlic, goat cheese...what's not to like? Plus, it is one of those dishes you prepare in little time, than leave it to the oven to do its magic. Cut top of garlic bulb and drizzle with olive oil. Wrap in foil and roast the garlic in the oven until tender, about 30-45 minutes. Let it cool slightly and smash the cloves. Increase oven temperature to 475 degrees F.
Halve squash and scoop out the seeds making room for the filling. Prepare the filling by mixing the herbs, goat cheese and mashed roasted garlic. Season with salt and pepper to taste. 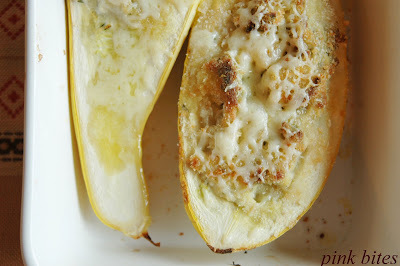 Fill squash with cheese mixture, top with bread crumbs and drizzle with olive oil. Roast in a preheated oven until golden, about 40 minutes. Remove from oven, top with Parmesan and continue baking until cheese is melted and golden brown. Those stuffed squash look really good!